Looking back at STAR TREK: THE MOTION PICTURE | Warped Factor - Words in the Key of Geek. In this week's Star Trek column Tom Pheby looks back at the debut big screen outing for the franchise, 1979's Star Trek: The Motion Picture. Cinema log 214103. Due to Hollywood's desire to remake films, I thought it might be fun to look back at Star Trek: The Motion Picture, and then the opening reboot to the series staring Chris Pine and Zachary Quinto - to see if there are any strange anomalies and present them to other life forms. In 1979, Kirk and Spock (Shatner and Nimoy) had been on extended leave since the late 1960s, a bit like America's space programme itself. Since The Original Series had been cancelled, in reality, man had set foot on the Moon, skipped and hopped around on the planets surface looking for dust samples and Astronaut Alan Shepard hit a golf ball that was never recovered. However we were still way behind the wonderful world of Trek, where warp drive propulsion was possible and deep space exploration was all the rage. It was somehow comforting to see the intrepid spacemen return to the bridge of the Enterprise in 1979, like they'd never been away - apart from the fact their collective ages had increased, as well as some of their waistlines! Kirk's hair had suddenly become twice as thick and stood aggressively on his head like a cat defending its territory. 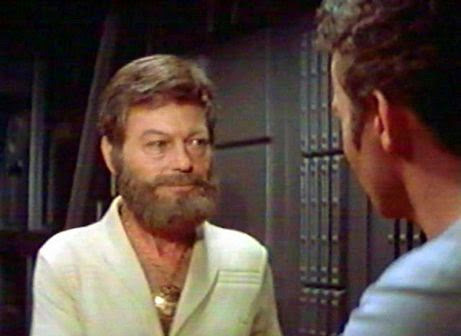 Dr McCoy (DeForest Kelly) had sufficient time to grow a beard, a spectacular one at that, as though he'd been marooned on an desert island that had yet to be discovered, and Mr Scott (James Doohan) was still struggling to come to terms with his Scottish accent. Kirk had lost a starship but gained a new spiffy Admiral's uniform, which just goes to show that even in the fictional future when you are deemed to be no further use you will end up with a meaningless job and a meaningless title, until such time that you become even more worthless and are forced to bow out gracefully - some things never change! But James T Kirk has no intention of settling down to a cushy desk job at the Federation. So we are left with the problem of how to find a suitable excuse to get them all back together on the Enterprise and pick up where we left off. Kirk manages to wangle just that after a large peculiar blue mass gobbles up the Klingon fleet and then a Star Fleet vessel on on it's way to Earth. This puts everyone at Red Alert - quite why alerts are given a colour is still beyond me, but I secretly love it none the less. 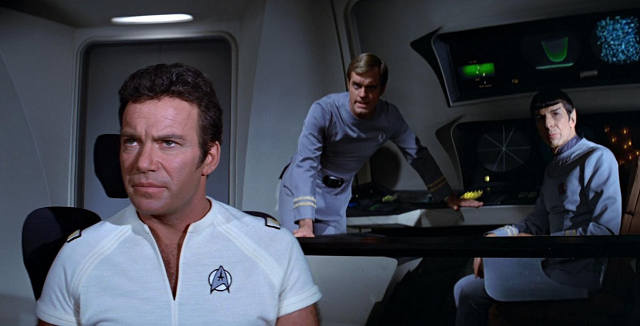 There's a fair bit of reacquainting to go through, mindless grinning and back slapping accompany an element of jaw dropping awe as Kirk approaches The Enterprise to relieve Captain William Decker (Stephen Collins) of his command. When he finally manages to trudge onboard and squeeze in the Captains chair it appears nothing's changed that much, it's like putting on a comfy pair of shoes that are a bit weathered and past their best but you still enjoy the feeling they give you. There's some mild and courteous hostility between Decker and the more experienced King of the cosmos, but it never reaches Warp Factor One, it's all a bit handbags at a safe distance and the script could have gone much deeper, but it all blows over like a tropical storm and jumps at light speed into the main crux of the story. Through Kirk, Shatner manages to reflect his all consuming desire to take command of the vessel at any cost and the seasoned veterans considerable ego is on display for all to see. This is to be repeated in Chris Pine's version in the reboot, so in this much continuity is maintained even if not exact, this way it avoids becoming a pale impersonation. Of course we were all eagerly awaiting Leonard Nimoy's return as Spock, not just for the sake of balance and to make up the cast numbers, but to discover where he's been. Well, he's been on a voyage of self discovery (actors refer to it as a period of rest, we know it better as unemployment!) to rid himself of these pesky emotions. Spock spent much of that time trying to obtain the Kolinahr, a sort of Vulcan equivalent of a Jim'll Fix It badge that implies the death of all emotion, but he fails at the last hurdle when he becomes aware of the unfolding drama. So the troubled Vulcan arrives at a point in the plot where his logic is desperately required (it's worth noting that his ears appear even more pointy than in the series). Zachary Quinto's version of the Science officer seems a little half baked and confusing at times. He still features the trademark ears, the eyebrows, the unfashionable haircut and the odd hand greeting, but his human side is emphasised in much greater detail. Exposing deep rooted insecurity's and frailty, on the whole this is genuinely well received but initially it requires a little more consideration and staying power. No doubt because Nimoy had defined the role for a generation, and it was always going to be difficult to adjust to anyone other than him. This could be why he, of all the actors, has a cameo in the reboot. So off we go! Not so much boldly, more gingerly than ever before, to investigate this unknown sprawling mass that's milling about in the far reaches of space. It's an intelligent, glossy, well scripted but slightly ponderous affair that attempts to add the odd subtle twist, and successfully avoids becoming a gung-ho laser blasting exercise - so typically Trek. I longed so much from this film version, after such a lengthy absence of new material and what seemed like an eternity of continuous re-runs of the series (filmed in Lycravision! ), and on many levels it didn't disappoint. 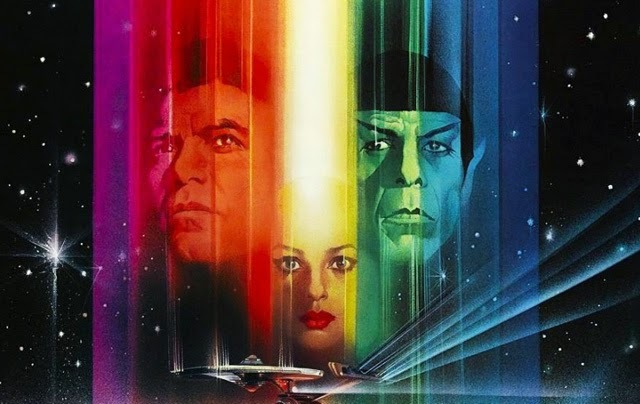 Star Trek The Motion Picture updates the saga, but not with total conviction. It could be viewed as a predictable response to the Star Wars phenomenon of the late 70s, but who genuinely gives a hoot about that. They were back where they belonged and we were thankful for that. Star Trek The Motion Picture is an immensely entertaining flick, yes it stutters on occasion but it's clear that it was put together with love and respect for the series. It's not as good as The Wrath of Khan, but it is better than some that followed. Many of the later installments became significantly damaged by the self indulgent stars who involved themselves in directing duties/story lines and scripts. Note to Hollywood - nothing kills a film franchise quicker than stars that are permitted to involve themselves in roles they are unaccustomed to! Although it has to be said that Nimoy was way ahead of Shatner when he sat in the directors chair. I'm a fan of the new J.J. Abrams rejigged universe too. The new debut outing was a more energetic, action packed extravaganza, and I think some have criticised it rather unfairly. The core of both movies rely on solid performances from the main actors and inventive scripts .Apart from Spock's surprising conquest of Uhura in the newer addition, the dynamic between the central characters largely remains the same. But lets not forget how we got here, Star Trek is one of the most enduring franchises ever. Kirk and the crew of the Starship Enterprise always remain firm favourites with an audience, and although I miss Shatner and Nimoy in the main roles, I'm happy that Pine and Quinto are on the Bridge. Next week Tom pays tribute to Gene Roddenberry, and the following week he looks further at the 2009 reboot Star Trek movie.